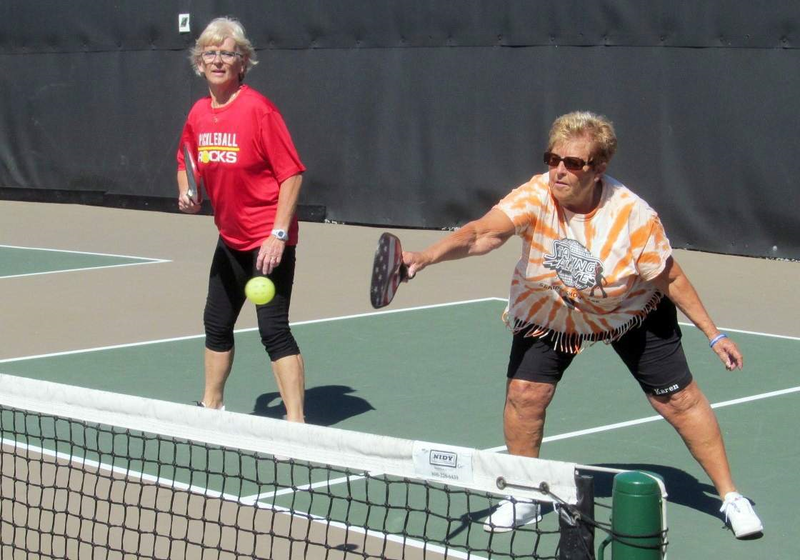 SEBRING — Tanglewood held its fourth annual Winter Classic Pickleball Tournament this past weekend, drawing players from such places as Fort Pierce, Okeechobee, Port St. Lucie, Punta Gorda, Sarasota, The Villages, Venice and Vero Beach, as well as Avon Park, Lake Placid and Sebring. The event was coordinated by Nancy Meyers of Pickleball Specialties. Tanglewood’s organizing team was chaired by Tom Stadler who oversaw a very large group of dedicated volunteers. Competition was by age and ability level. The rating scale goes from 2.5 (relative beginner) to 5.0 (expert). The number of participants in a particular grouping determined whether it was a round-robin or a double-elimination competition. Men’s and women’s doubles play took place on Friday. It was a chilly start to the day but warmed up to a very comfortable temperature for pickleball. The wind did affect games as it sometimes played havoc with the light plastic whiffle-type balls. Men’s play saw locals sweep the combined 2.5/3.0 competition in the 50 to 59 age group with Larry Colley and John Sproule of Sebring Village taking gold, Joe Doyle and Walter Finhert of Tanglewood capturing silver, while Kevin Butler of Sebring and Don Boltz from Tanglewood combined for bronze. Butler demonstrated great dexterity playing in a wheelchair against his able-bodied competitors.